MADISON—While hundreds of Wisconsin high school football fans streamed into Camp Randall Stadium Friday, Nov. 16, for the high school playoffs, 77 students gathered in a quiet, airy room on the University of Wisconsin-Madison campus to learn that global health opens career doors they never anticipated—in their communities and across the world. Students from the Clinton, Janesville Craig, Janesville Parker, Marshall, Milton, Portage and Sun Prairie high schools spent the day at “Opening Doors to the World,” the sixth annual High School Global Public Health Day at UW-Madison. Hosted by the UW-Madison Global Health Institute (GHI) and the South Central Region Area Health Education Center (AHEC), the program is designed to show students the many ways they can be involved in public health and how social and environmental conditions lead to very different health outcomes. See more photos. 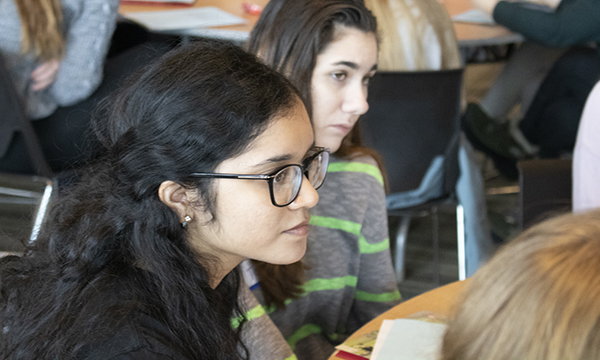 Maria Moreno, GHI associate for Experiential Education, works with students during the sixth annual High School Global Public Health Day at UW-Madison. 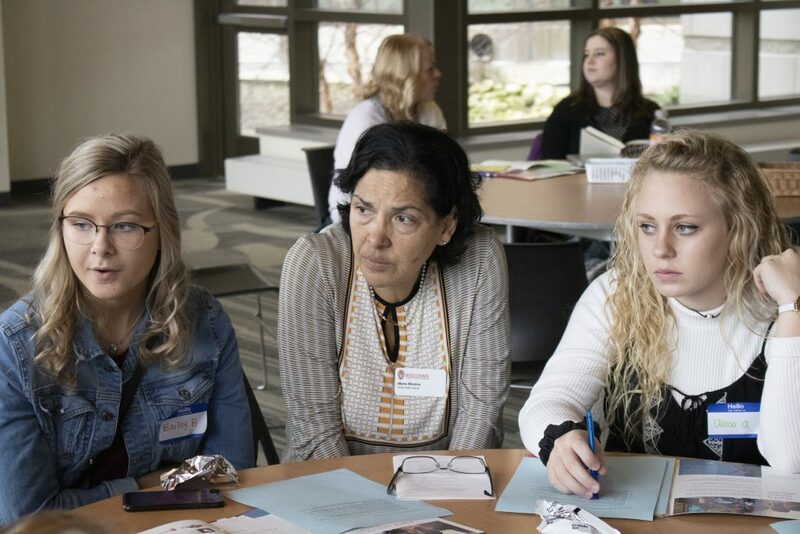 Janesville Parker teacher Janice Verhulst incorporates the global health day into her curriculum. Janesville Craig teacher Abby Gunther says she appreciates that students see life isn’t the same across the world. Portage high school students Travis Miller, right, and Isaac Brockley find inspiration and learn about global health disparities at the sixth annual High School Global Public Health Day. Brockley plans to be a nurse, and the day inspires him to work internationally. Clinton student Lauren Corral appreciates the chance to visit with medical students. “You get to see another side of the world,” she says. UW students from GlobeMed at UW-Madison, Partners in Health-Engage Madison and Wisconsin MEDLIFE, who organized and presented the program, wish they could have attended a high school global health day. MEDLIFE president Diane Xue from Germantown grew up knowing what a doctor or a nurse did, but no one talked about public health, she says. 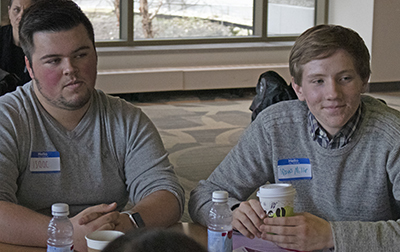 High School Global Health Day also lets student organizations share their enthusiasm for global health and gives high school students a “great opportunity to meet people who’ll be part of global health,” she says. 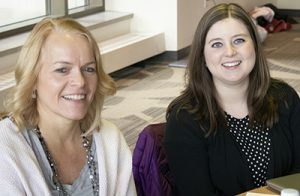 Teachers Janice Verhulst, left, from Janesville Parker and Abby Gunther from Janesville Craig see new opportunities for their students at the UW-Madison High School Global Public Health Day. The South Central Region AHEC is part of a national network of programs dedicated to connecting students to careers, professionals to communities, and communities to better health. GHI is committed to improving health for all today and tomorrow by addressing the multi-layered causes of disease. The institute fosters research, education and outreach collaboration across disciplines and encourages the sustainable use of global resources. For more information, visit ghi.wisc.edu.